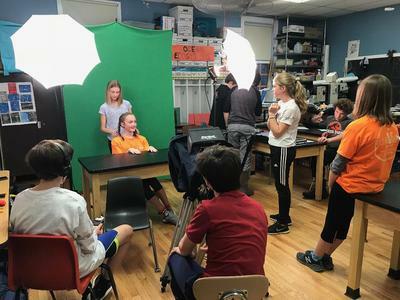 The Calvineers film their award-winning podcasts in Bill McWeeny’s classroom at the Adams School. Work on The Calvineers Movie continues for the students involved in the program at the Adams School. The group has traveled to dozens of conferences over the years and is well known in the science community for their research on North Atlantic right whales. Through their work on the movie with director and film maker Thom Willey and his partner Laurie Flood, this year’s students put together a series of podcasts detailing their research. Those podcasts were submitted to the 2019 Healthy Whale, Healthy Ocean Challenge, sponsored by Bow Seat Ocean Awareness Programs and Conservation Law Foundation. It was recently announced their collective submissions won the gold award in the 4 to 7-minute film category. The students will be presented with the award at a ceremony in Boston in early May. The podcasts were filmed in Calvineers’ leader Bill McWeeny’s classroom at the Adams School, where the students do a substantial part of their research during the school year.